TimerCap is an easy to use device that helps you stop worrying if you or your loved ones are taking medication as needed. They have a built-in stopwatch with an automatic sensor starts counting up the seconds, minutes, and hours since last opened. This lets you know precisely to the minute the last time you took your medication without the worry of pressing any buttons or setting any alarms. It's the perfect pill organizer that lets you manage your medication in its bottle and keep your prescription label and safety information at your fingertips. It is the perfect way to seamlessly coordinate care of children, teens, elders, or pets as you will always know when the last dose was taken, even if someone forgets to mention it or write it down. TimerCap provides the peace of mind of knowing your loved one has received their medications as needed. TimerCap protects the patient and their family. Since TimerCap is tamper resistant and resets every time it is opened, it's the perfect tool to deter abuse, theft and medication mistakes. Included in the kit are caps, bottles, tracker forms and bottle labels for your convenience. Have you ever forgotten a dose? Download our free app for medication reminders to your smart device. 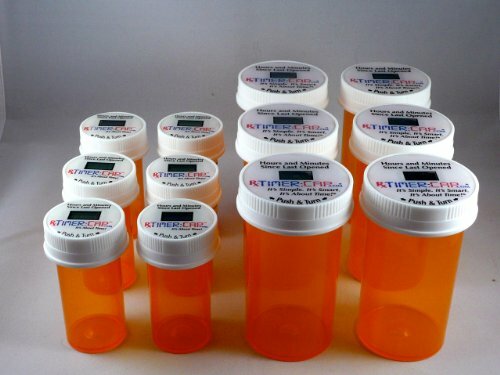 TimerCaps and bottles are also easily transported and allow you to keep the prescription labeling information with you at all times. The batteries are replaceable and last 12-18 months. Battery Lasts 12 - 18 Months & ARE Replaceable.